Are you planning a trip to the beach and worrying about the risk of sunburn? Will you be taking babies or little ones along on your family vacation and are you concerned about your children getting burned as well? Would you like a quick and easy way to provide plenty of shade when you’re enjoying your fun in the sun? If any of this sounds like you, you’re in luck! 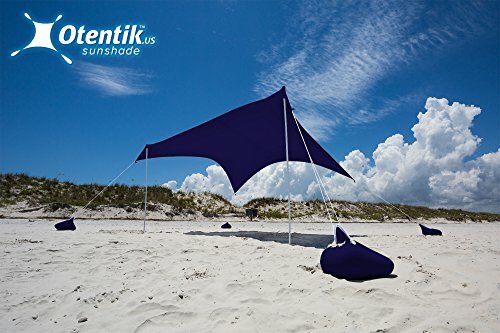 There’s a great product out there that can help you solve these problems and much more: the Otentik Beach Sun Shade. Otentik thinks from a customer’s point of view and creates products that are as user-friendly as they are attractive and durable. Otentik provides several products that range in size and price depending on the needs of their customers. Otentik cares about their customers and will happily answer any questions or concerns. As you can see, there are a lot of excellent reasons to buy from this great company. If you’re still wanting to learn more about the Otentik Beach SunShade, read on! The Otentik Beach SunShade is one of the best and most well-known products in the world of beach shades, and with good reason. This high-quality product has been shielding families from the sun at the beach for years already, and with its unique and innovative sandbag design, it’s easier to hold it in place for a whole day at the beach than any umbrella ever was. This product is easy to set up in just a few short minutes even if you don’t have help, and a couple of adults working together can make short work of the job, too. This is a must-have for any outdoorsy family! This product is made of durable microfiber that stretches taut enough to get the job done but not so tight that it will rip or become too easily damaged. The SunShade is made of UPF 50+ fabric that can help protect you and your whole family from the sun. The microfiber used in this product is water repellant and eco-friendly. Including the poles needed to set up this product, the entire weight of the SunShade is only four to five pounds depending on the size of the shade you choose. We love how adjustable this product is. With the included four tent-style poles, you can simply shift the angle of the SunShade until you have it exactly right. And since the poles are only weighted down with sandbags and not with stakes or spikes, they’re easier to move throughout the day as the sun changes its position in the sky, too. Spread the poles out far to create a sharp angle that works similarly to a tent, or keep them closer together for something that functions more like a canopy gazebo instead. The biggest complaint with this product that many customers have is that the poles are made out of steel instead of aluminum. This means that they’re more durable and won’t knock over as easily in the wind, but it also means that they can rust when exposed to saltwater for too long, especially if they aren’t cleaned and stored well afterward. This also makes the poles heavier to carry than they would be if they were made out of aluminum. There are good reasons for the decision to make the poles out of steel, but for some customers, this is a downside that could be rectified. This great product is available in a couple of different sizes and tons of different colors to help you find the perfect fit for your needs and preferences both. The fabric of the canopy and the sandbags both is stretchy and durable, so you don’t have to worry about tearing it if you stretch it out very far. Because of the design of this product, it provides tons of breezy airflow underneath the canopy, which makes it especially good and safe for use with babies and little children. Since the SunShade can be adjusted throughout the day with no trouble, you can move it around if the wind changes direction, too. Because of the way the product is designed, there is always a chance it could end up positioned just so that the wind could pick it up and knock it over, although this is not likely if you work on your placement as you’re putting it up. Some customers have received a canopy that has a large seam running through it, which may take away from the aesthetic appeal of the product overall. Some customers may feel as though this product is a little bit too expensive for the type of canopy it is. Use it to keep your little ones protected from harmful UV rays when you’re at the beach. Use it when you’re spending a day at the lake by setting it up in the water itself and lounging around on floating chairs or even in beach chairs directly in the water. This can be extra refreshing in the hot weather! Set one up in your backyard for your kids to play under when the weather turns too hot for normal outdoor play. Of course, you may come up with your own ways to use this SunShade, too. Bring one home and see how many exciting experiences you can have with it.